Kris insists that nobody will be able to tell what it is unless I put a label or something on the card. I’m a bit nonplussed that he says that: he’s lived in Fukuoka and Hokkaido for 3 years with a Japanese woman, if he can’t tell what it is, maybe nobody else will? He even suggested I hold a quiz on my blog and ask readers “What do you think this is?” Hence the title of my post, “What are you?” Pfft. Men. 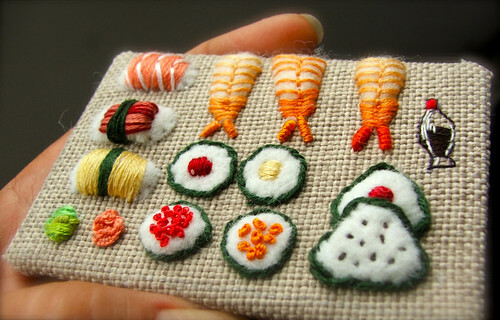 *ahem* it’s miniature, embroidered sushi…please tell me you knew it at first glance! This is an embroidered ATC for Hanna, the creative whirlwind behind iHanna…and this is our first swap, ever! 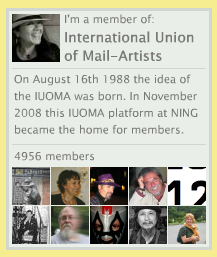 We’ve been stalking each other’s blogs for a while now…to find that the respect and admiration each felt, was mutual. So we’re taking the virtual friendship a teensy step further, now, by agreeing to exchange small-scale embroideries. *raises hand* I knew, I knew! Wakarimashita! Sorry, I really only know a little pidgin Japanese, from Manga & Anime. What does “Jozu desu ne?” mean? 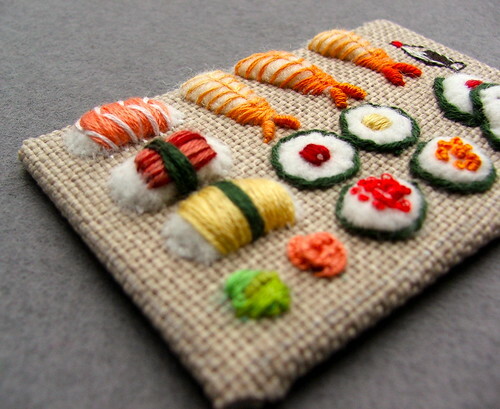 Of course it’s embroidered sushi, it even has it’s own little fish-shaped soy sauce! love it, I wish my embroidery was this good. No doubt what it was because I feel hungry when looking at it… It arrived today (on Valentines! and I ♥ looooove ♥ it so much. Thank you Natalie! Great! So glad it got there fast. Thank you for doing a swap with me! I am restless to see yours when I get home! The cutest plate of shushi I have seen in months! More the decorative than a real one. This is FREAKING AWESOME! Most excellent needling. Love this! The little soy sauce fish is adorable. Whoa, awesome! Incredible craftsmanship – I knew it was sushi right away! Not only am I not Japanese, I am allergic to fish – and I still knew what it was! The only sort of sushi I could bear to have within range of my nose… Well done! Wow, that’s great! I love the sushi, and YES I knew right away what it was. I’m not Japanese. I’ve never eaten sushi. I still knew that’s what it was! Not that I knew specifically what each item is (‘cept maybe shrimp? ), but I knew it was sushi. Don’t listen to this Kris character – those pictures had me at hello. i have to agree with “Pfft. Men.” I knew immediately what it was. and have to admit i’m hugely envious of this swap between you two. this is just so, so good. and small scale too! you amaze! I knew at a glance that it was sushi! Love it! Just my favourite food! I instantly knew and wanted to grab (and eat if it was real… I miss sushi!). We knew instantly – that’s me and my Japanophile 14 yr old daughter, who is in love with it!! love it! i have several friends that would love it too! would make a great gift, or learning piece for those friends who might actually pick up a needle for this one! Of course it’s sushi, what else could it be?? I think Hanna would like it A LOT! I could immediately tell what your ATC was. I love the dimensionality of it. I immediately knew it was sushi AND it made me hungry! I don’t know much about embroidery but I do eat Japanese food regularly. I thought what you meant by, “I knew exactly what I was going to do” was eat sushi and photograph it… but then I took a closer look. I loooooove it. I knew it was Sushi from the first glance….tell Kris! No label needed. It’s a wonderful use of your imagination! I knew at first glance. I love it. It boggles the mind that he actually lives in Japan and didn’t know what it was. I thought it was quite obvious. I knew immediately what it was, and it made me want to have sushi tonight. I love and your blog, which i just discovered. I knew right away what it was – I thought it was real sushi for a few brief seconds. When I realized it was embroidery, I thought it was great. When I read that it was an ATC, I was mesmerized, because it is much smaller scale than I realized. I am so pleased to have discovered your blog and to see your work! I could definitely tell it was sushi just from looking at it! Oh thats awesome! 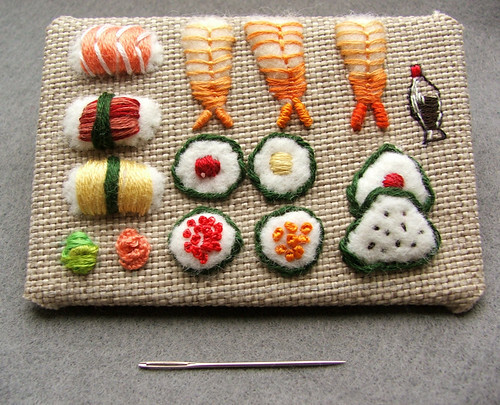 I particularly like how three-dimensional the onigiri and other sushi pieces are 🙂 And french knots are perfect for roe.